Quin smart technology and bluetooth system is invisibly integrated into every Quin helmet. The speakers, mic and circuitry fit seamlessly into the helmet without compromising comfort, fit or aerodynamics. The IntelliQuin smart system provides 21st century safety essentials, never before available to riders. 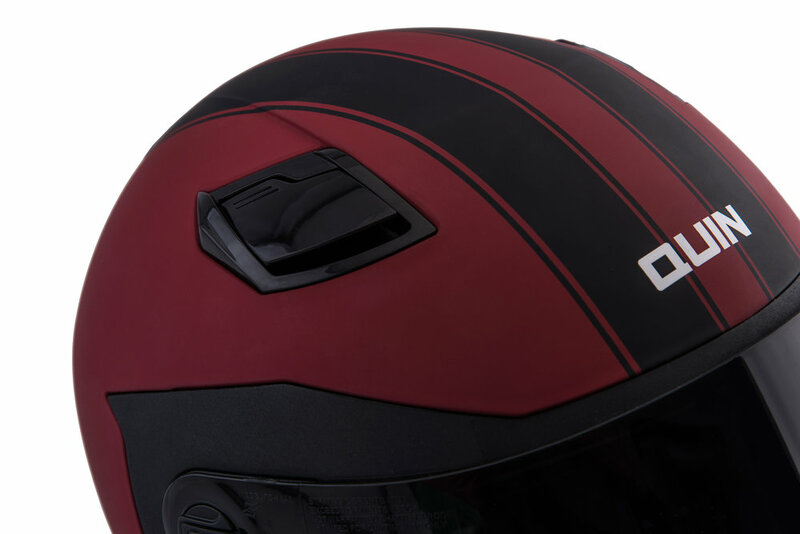 The IntelliQuin Smart System makes Quin the first motorcycle helmet to offer integrated Crash Detection and SOS Beacon. The features are focussed on the rider's needs, ensuring that distraction is never a part of your ride. IntelliQuin delivers modern safety essentials. Nothing more. Nothing less. Quin helmets and technology are designed as a system, so there are no add-ons necessary. This makes the Quin system one-of-a-kind, unobtrusive, intelligent and minimal. The heart of the IntelliQuin System. Designed and Developed by Quintessential Design, the Quin Arc Chip uses Bluetooth 4.0 protocols to communicate with the sensors on the helmet as well as those in the rider's smart phone. This little chip, and its ability to coordinate between the tech in the helmet hardware and the tech in your phone, is what makes the IntelliQuin Crash Detection the most reliable and complete safety system out there. IntelliQuin Crash Detection is the first ever crash detection system integrated with the helmet hardware. Every Quin helmet has an integrated accelerometer that is a part of its proprietary circuitry and corresponding algorithm for detecting and measuring a crash. 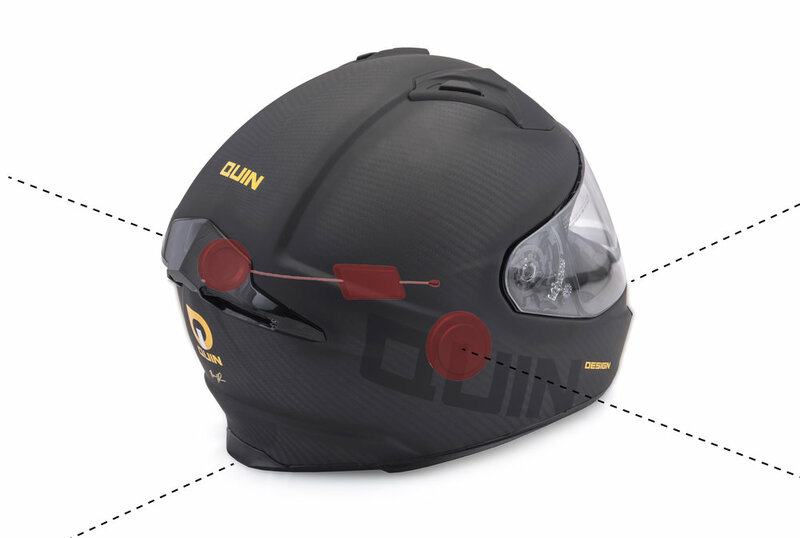 The helmet integration component is the most critical factor in the reliability of the Quin Crash Detection system. IntelliQuin SOS Beacon provides live-tracking of a rider who is in need of help on-the-move. This is particularly appealing for riders living in less safe geographies where crime or harassment are high. Both Crash Detection and SOS Beacon come with their own protocols for triggering the optimal emergency response. The IntelliQuin smart technology is always evolving, and delivers new features over time. DFU (Device Firmware Upgrade) is built into the technology so that any software updates, new features, or bug fixes can be rolled out by simply plugging your helmet in through the integrated micro-USD cable. Quin Helmets are the perfect blend of classic design and technology, proving that you don't have to sacrifice on one to have the other. Experience a new level of performance. The Quin bluetooth control panel is designed to be unlike anything you have ever seen on a motorcycle helmet. It is sleek and efficient, improving the aerodynamics and functionality of bluetooth connectivity. Every 2018 Quin Helmet comes in a unique Matte-Luxe finish, which gives the helmets a clean and soft look. It appears velvety soft while offering resistance to wear and tear. Looks like luxury, wears like machinery. All Quin technology is completely invisibly integrated. The circuitry is contained in special water-proof housing within the helmet structure, making the tech resistant to wear and tear. Every Quin Helmet comes with unique colour-matched quilted lining. It is soft, durable, and oh-so-luxurious. Having control over the ventilation on your helmet is important. The aerodynamic vent system is designed to reduce wind noise, giving you the ability to cool off, and maintain audio quality for the bluetooth system. Each helmet has been designed looking after the tiniest detail. From the matte-luze finish, to the quilted lining, to chrome piping, and leather detailing on the open face model. Quin Helmets are a delight to look at from every angle. The internal sun visor is built into both the Quin SpitFire and the Quin McQ helmet models. The tinted drop down visor puts control over distracting sun rays at your fingertips through a smooth analogue lever. The Quin McQ open face model is integrated with a universal 3 snap-button system so the rider can choose the visor style that suits their ride. For best microphone performence, choose a full face windshield. Why sacrifice style when boosting performance with technology?